I'm not completely sold on the fact that Dance Legend polishes are considered 'indie', but seeing as Uma used an Anna Gorelova polish on Day 1, I'm going with it. Plus it means that for day four I'm still pulling mani's from the vault, albeit that this one is only two weeks old, its still a mani that I didn't specially prepare for this week. Later this year we are planning a big trip to the USA during September and October, which means I'm not going to be around for the 31 Day Challenge, so can you believe that I've already started preparing my manis so they can all be scheduled to post before I go. That's the truth as to why I have such a bunch of manis in waiting, so it looks like I'll just have to prepare a whole bunch more now. 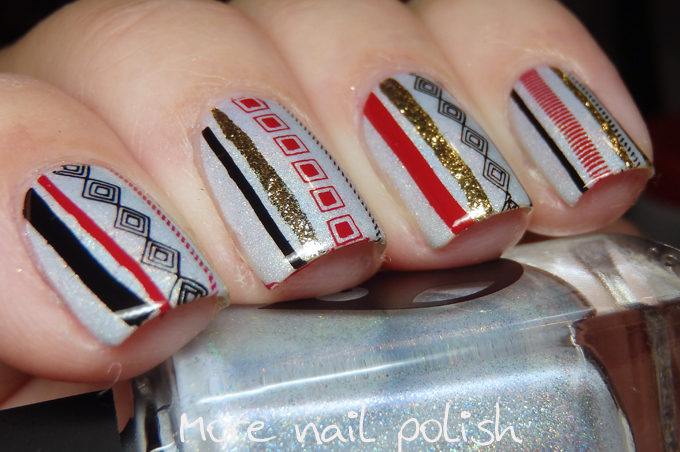 Today's mani actually took ages to do, all because each element was pretty much stamped individually (with the exception of the gold lines) I used the Lina Feeling Shapely 09 plate. Plus I did paint all ten fingers like this, cause that's just how I roll. 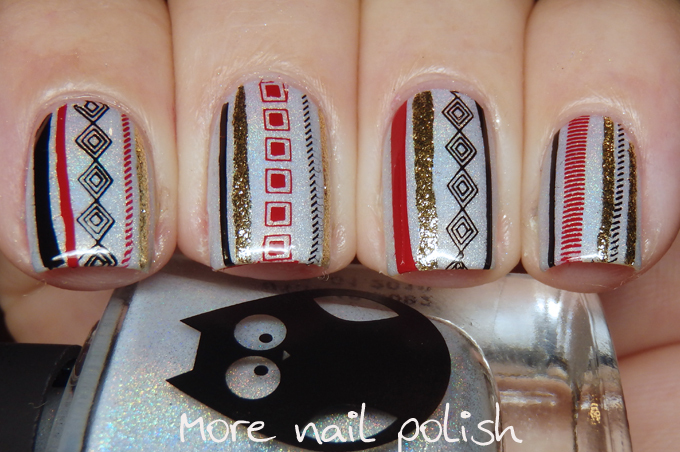 In fact it's pretty rare for me not to paint all ten nails with nail art so I can totally appreciate my efforts. 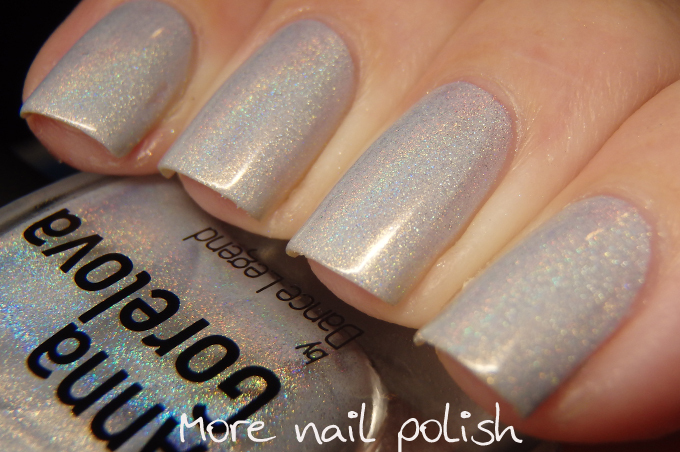 The base polish here is Anna Gorelova Seagull. I don't own many white-ish holos. I can actually only think of one other that I have with a linear holo like this, and that is Emily de Molly Crystal Crown. 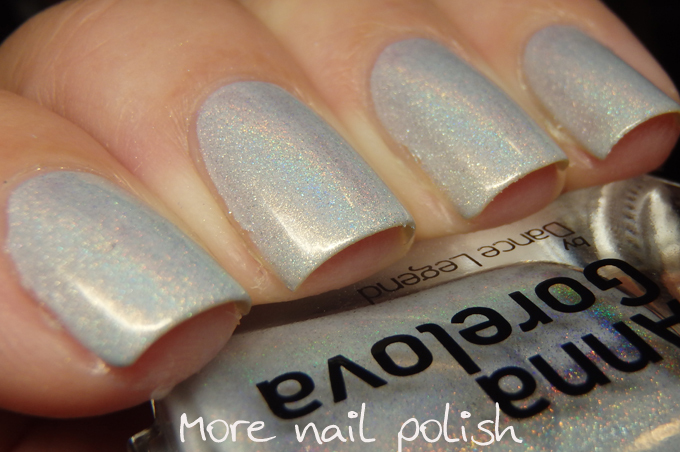 What they both have in common is a golden shimmer in addition to the linear holo flame. I'd say these two are quite similar, although I bet if I did a side by side comparison I'd find they are totally different. Either way, I love them both and they make a great base for nail art.